This week was a good one! I turned 30 on Tuesday and was treated like royalty. It was a lot of fun! I am linking up with Della, Katie, Tif, and Becky for H54F. 1.) I had my 26 week appointment with my OB last week. He is such a great doctor and got Miss. E to help find the heartbeat! It was so sweet and she was so excited! We had a nice time in the city and I even found everything I needed for groceries at one store! It was a good day. 2.) 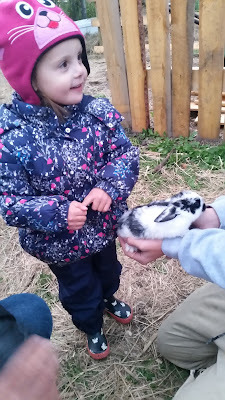 On Friday night we went to a local corn maze and petting zoo with my family. It was such a fun activity. Miss. E loved the animals and even walked most of the maze. I was pretty impressed! My brother is dating an awesome woman and we got to meet her three daughters at the maze. Her daughters are as lovely as she is and we are so happy that they are all in our lives now. Yup. She is wearing her winter jacket. It went from super hot to cold in a matter of days! 3.) On Sunday we attended a birthday party and worked in the garden. Both were tons of fun. Miss. E enjoyed playing with all of the kids at the birthday. 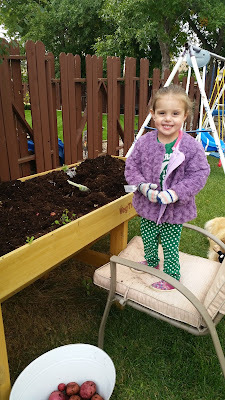 When we got home she came outside to help me harvest the potatoes from our little garden. She squealed every time we found a potato under the dirt. It was so cute and hilarious. She is quite a good little helper in the garden! 4.) Hubby didn't have work on Monday and I came home to a BIG surprise. The back story to this surprise is that when we bought this house Hubby agreed that I could paint the walls however I wanted, but he made it clear that he was not going to help. Hubby hates painting. I managed to get all of the main areas of the upstairs done before I found out I was pregnant. When I found out I was expecting I made the decision to put the painting on hold until after baby arrived. The only rooms left to paint were the master bedroom and the (now) baby room. 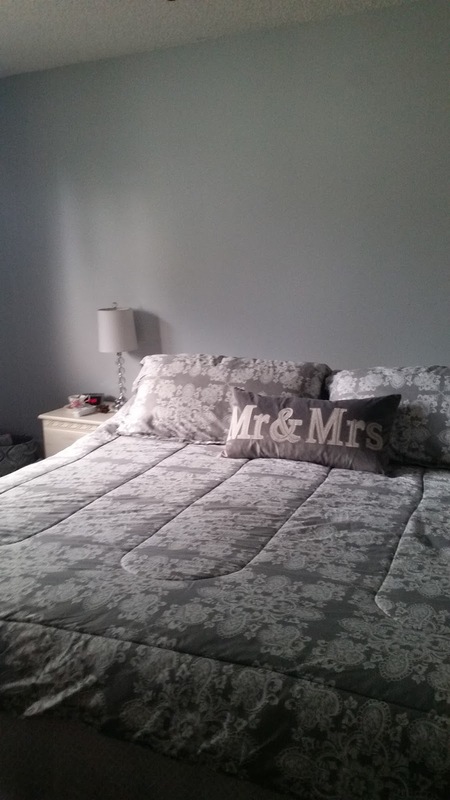 The master bedroom had a hideous dark brown accent wall complete with dings and scrapes. I absolutely hated it, but I knew it would have to wait. I walked into my room after work to change my clothes and I burst into (happy) tears. Hubby had painted the room while I was at work! It looks a million times better! I couldn't have asked for a more thoughtful gift. 5.) 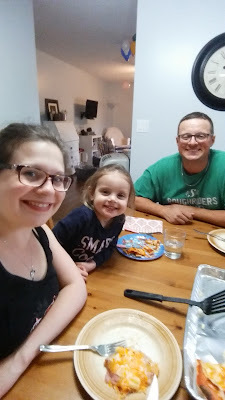 I turned 30 on Tuesday and I was super spoiled by everyone that day. A coworker brought me a cake and gave me a lovely card. Another coworker gave me a bag of B.C. apples that she had got from an orchard a few days prior. My boss bought all the staff pizza for lunch to celebrate my 30th. It was a delicious day and everyone was speaking my love language: food. When I got home my parents stopped by, which is always fun. Hubby and Miss. E made me a yummy pizza supper. Hubby had also made me a black forest cake, which was soooo delicious. Hubby knocked my gift out of the park with a homemade bath tray. I have been ogling them for months and he did such a fantastic job building mine. Miss. E made me the sweetest card and repeatedly told me happy birthday. It was a great day! The birthday festivities are continuing here this weekend. We are having family and a few friends over to celebrate on Saturday. I am excited to see everyone! I hope you all have a fabulous weekend! That's so awesome that your hubby painted the wall for you!! What an awesome gift!! (I also hate painting.) 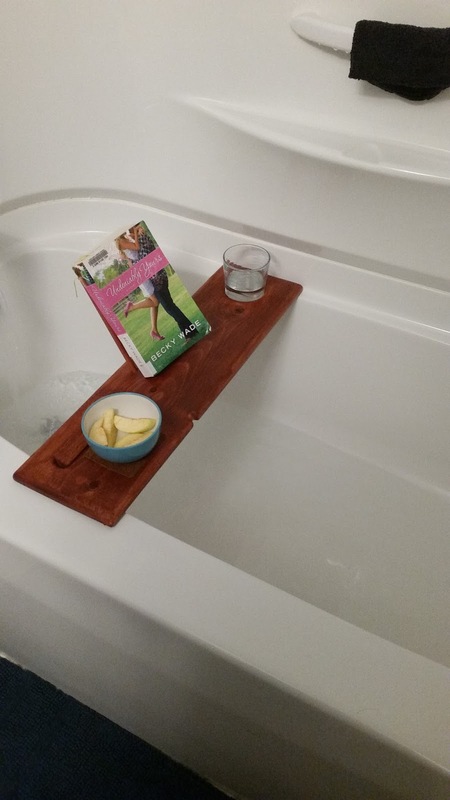 And that bath tray is awesome. It really sounds like you had a wonderful birthday! !